If you're trying to eat healthier, you may be considering omitting meat from your diet. Many restaurants and supermarkets now offer protein alternatives to make your decision easier. But is a vegetarian diet healthier? Learn about the pros and cons of a diet for vegetarian or vegan vs. a meat-eater to inform you as you consider changing your lifestyle. Although all vegetarians avoid eating meat, poultry and sometimes fish, there are many different variations of the vegetarian diet. Vegans are total vegetarians who do not eat any animal products such meat, poultry and fish, including dairy products, eggs and honey. Lacto vegetarians avoid all meat, poultry, fish and eggs, but they consume dairy products. Lacto-ovo vegetarians don't eat the flesh of any animal. No meat, poultry or fish, but eggs and dairy products are acceptable. Ovo vegetarians eat eggs but refrain from eating meat, poultry, fish and dairy products. Pesco vegetarians or pescatarians avoid meat but may eat fish. Pollo-vegetarians don't eat red meat but eat poultry. How Many People Are Vegetarians? Approximately 8 million adults in the U.S. do not eat meat, poultry or fish, according to the 2016 National Harris Poll published by the Vegetarian Resource Group. About one-half of vegetarians are also vegans — approximately 3.7 million U.S. adults. Additionally, an increasing number of people have omitted or cut back on red meat consumption but still eat chicken and fish. Statistics show that 37 percent of Americans often or always eat vegetarian meals when dining out. This has major implications on the food and restaurant industry, which must offer meat alternatives and vegetarian dishes. The 2015-2020 Dietary Guidelines recommends the Healthy Vegetarian Eating Pattern as a nutritious diet for vegetarians. Many nutritionists maintain that proper vegetarian and vegan diets that follow health guidelines can be healthier than meat-eating diets. For example, The American Diabetic Association recognizes plant-based eating as not only nutritionally sufficient, but a healthy option even if you have diabetes. Compared to meat eaters, vegetarians usually eat less saturated fat and more fiber, vitamins C and E, magnesium, potassium, folic acid and phytochemicals, such as carotenoids and flavonoids. For this reason, vegetarians are likely to have lower total and LDL cholesterol, lower blood pressure and less body mass, all of which may contribute to a reduced risk for many chronic diseases, says Harvard Health. The Journal of Academy of Nutrition and Dietetics confirms that vegetarian diets are nutritionally adequate for all stages of life, including pregnant women, infants through older adults and athletes. The 2016 study reported that plant-based diets are associated with a reduced risk of health conditions, including hypertension, heart disease, Type 2 diabetes, certain types of cancer and obesity. Characteristics of vegetarian and vegan diets that have been found to contribute to the reduction of chronic disease include a low intake of saturated fat and high consumption of vegetables, fruits, whole grains, legumes, soy products, nuts and seeds. Other research has indicated opposite findings and suggests that vegetarianism may put you more at risk in terms of chronic disease and other conditions compared to a meat-eating diet. A study conducted by the Medical University of Graz in Austria reviewed the differences in dietary habits and lifestyle between carnivores and vegetarians. Groups in the study consisted of meat eaters who ate lots of fruits and vegetables, normal eaters who ate less meat, people who ate a more meat-heavy diet, and vegetarians. The findings, published in PLoS One in 2014, reported that vegetarians consumed less alcohol and had lower body mass indexes, but showed an elevated risk of cancer, allergies and mental health disorders, such as anxiety and depression. Numerous studies have shown a positive benefit in the reduction and risk of cancer in vegetarians vs. meat eaters. The Canadian Cancer Society says that a diet high in fat, especially from meat and high intakes of dairy products, increases the risk for prostate cancer. Prostate cancer is the second-most frequent cancer among men. Research shows that a vegan diet may lower prostate cancer risk. A cohort study published in the American Journal of Clinical Nutrition in 2016 examined the dietary patterns of nonvegetarian, lacto-ovo-, pesco-, vegan, and semi-vegetarians and prostate cancer. 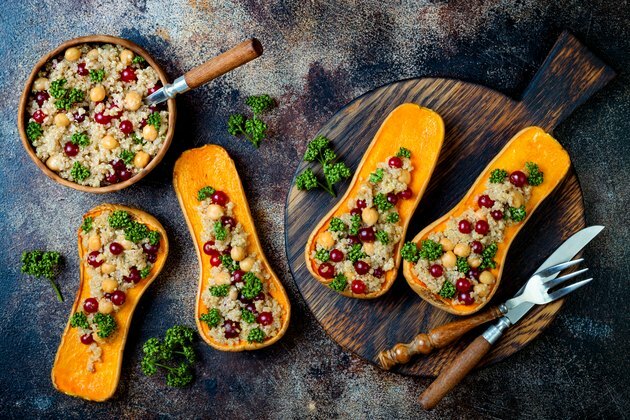 Results showed an inverse association between the vegan diet and prostate cancer risk compared with the nonvegetarian group. Those who followed a vegan diet experienced a 35 percent lower risk of prostate cancer than any of the other dietary groups studied. Researchers suspected that higher intakes of fiber, lower consumption of saturated fat from animal protein, and the anti-inflammatory content of fruits and vegetables in a vegan diet were contributors to lower cancer risk. Heart disease causes more deaths per year, not only in the U.S., but in all developed countries. Evidence suggests that diet is responsible for a significantly lower risk of cardiac arrest and heart disease in vegan and vegetarian individuals. A 2013 study from the University of Oxford found that vegetarians have a 32 percent lower risk of hospitalization from cardiovascular disease compared to meat and fish eaters. An analysis of 45,000 volunteers, of whom 34 percent were vegetarian, took into consideration factors such as smoking, diet, exercise and alcohol consumption. The conclusions, published in the American Journal of Clinical Nutrition, suggested the lower blood pressure and cholesterol levels in the vegetarians contributed to their reduced risk of heart disease compared to the non-vegetarians. Vegetarianism does have the potential for nutritional deficiencies. Being a vegetarian often presents some challenges when it comes to getting all the nutrients your body needs. Vegetarian diets are usually adequate in carbohydrates, polyunsaturated fatty acids, dietary fiber, carotenoids, folic acid, Vitamin C and magnesium. However, these diets are often low in protein, saturated fatty acids, zinc, iron and calcium. Additionally vegetarians may be deficient in vitamins B12 and retinal, which are found only in animal-derived sources. It is necessary to find alternate plant-based sources of protein, vitamin B12, vitamin B6 and iron, which are all readily available in meat. Food choices are more restricted for vegans. But it's not impossible to achieve a completely nutritious vegetarian or vegan diet with some careful planning. Ultimately, adopting a vegetarian diet can be a healthy option, but achieving a well-balanced diet is key to receiving all the health benefits possible. Dietary Guidelines recommends you get 46 grams of protein a day for women and 52 to 56 grams for men, depending on age. According to the report from a study published in the Journal of the American College of Cardiology, all plants contain protein in varying amounts. The study says plant protein-rich foods, such as legumes, contain healthier protein than most animal foods, without the fat or sodium. For example, although a 6-oz. steak may have up to 40 grams of protein, it also contains 12 grams of saturated fats, while 1 cup of lentils contains 18 grams of protein and no fat. Many people worry about getting all the essential amino acids, which vary in each food, but nearly all plant-derived foods contain some or most of these essential amino acids. According to KidsHealth, combining certain foods in a meal to make a complete protein is no longer considered mandatory as long as you maintain a healthy, balanced diet throughout the day. Some good sources of plant-based protein that are suitable for vegans include soy milk, nuts and nut butters, seeds, pulses (legumes), tofu, chickpeas and beans, hemp seed and green peas. Vegans and vegetarians have a higher risk of a vitamin B12 deficiency compared with people who eat meat. This is because your body cannot efficiently process the plant-based form of vitamin B12. Furthermore, although egg yolks and dairy products are a source, they contain very little vitamin B12 and are not an option for lacto-ovo vegetarians. A 2014 publication in Nutrients suggests that dried purple laver, commonly known as nori, is the best vitamin B12 source presently available for vegetarians. Fortified foods are recommended for all vegetarians, and taking a supplement is encouraged to ensure you get adequate amounts of vitamin B12. According to Anne-Sophie Brazeau, an assistant professor of Human Nutrition at McGill University, iron from plant-based foods, known as non-heme iron, is not absorbed as well as iron from animal sources. Therefore, vegetarians need to consume twice the amount of iron to get the same benefits that meat provides. The absorption of non-heme iron is enhanced by vitamin C found in fruits and vegetables. However, iron absorption may be inhibited by the phytic acid found in whole grains, beans, lentils, nuts and seeds. Some iron sources from plants include cocoa powder, legumes, molasses and leafy greens such as spinach, kale and chard. A study conducted at the University of Brisbane found vegetarians to be more susceptible to depression than meat eaters. Almost 10,000 people from the UK were assessed, with the result being that vegetarians were almost twice as likely to develop depression, perhaps due to vitamin and mineral deficiencies. As published in the Journal of Affective Disorders in 2017, conclusions noted that a vegetarian diet tends to be inadequate in vitamin B12, finding a 50 percent deficiency in vegans and a 7 percent deficiency in vegetarians. Vitamin B12 plays an important role in mental health and can affect mood. Also the lack of iron, often associated with a vegan diet, can be attributed to the development of depression. According to Vegan Health, statistics from the 2015 EPIC-Oxford paper reported the overall rate of deaths from cancer not significantly different between vegetarians, vegans and regular meat eaters. Vegetarians had lower rates of death resulting from pancreatic and lymphatic cancer but not from lung, breast, colorectal or ovarian cancers. The Vegetarian Resource Group: How Many Adults in the U.S. are Vegetarian and Vegan? Human Research Council: Why or Why Not Vegetarian? American Journal of Clinical Nutrition: Are Strict Vegetarians Protected Against Prostate Cancer? The McGill Tribune: Are Vegetarians Healthier Than Meat Eaters?